Parliament's vote on British Prime Minister Theresa May's Brexit deal will go ahead on December 11, her office said on Thursday. May has repeatedly said that if MPs reject her deal with Brussels, which would see Britain exit the EU on March 29 with continued close ties, the only alternatives are leaving without a deal or reversing Brexit. 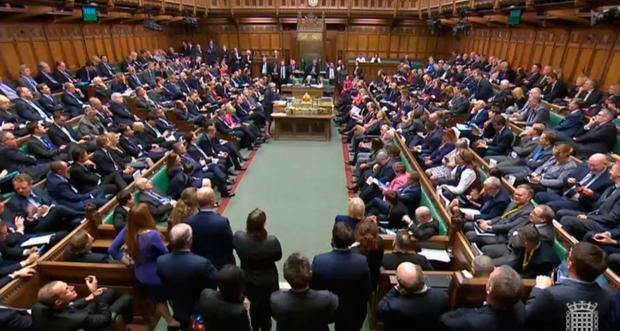 The British parliament is mid-way through a five-day debate on the Brexit deal, ahead of the crunch vote which will define Britain's departure from the EU and could determine May's own future as leader. She currently looks set to lose that vote. The Times newspaper reported that senior ministers were urging the prime minister to delay it for fear of a rout. "The vote will take place on Tuesday as planned," May's spokeswoman said. The House of Commons leader, Andrea Leadsom, also told parliament the vote would go ahead on Dec. 11. The day before the vote, on Dec. 10, the European Union's top court will deliver a judgment on whether Britain can unilaterally halt Brexit. EU negotiator Michel Barnier said on Thursday that the only deal available was the one agreed with Brussels. "The agreement that is on the table -- the withdrawal agreement and the agreement on the future relationship -- are, in our view, the only and best possible to organise an orderly withdrawal," Barnier said. May used an interview on BBC radio on Thursday to press on with her bid to persuade lawmakers to back her deal. "There are three options: one is to leave the European Union with a deal ... the other two are that we leave without a deal or that we have no Brexit at all," she said. In one small potential change, May said she was speaking to lawmakers about giving parliament a bigger role in deciding whether to trigger a so-called Northern Irish backstop. Concerns about the backstop are a key driver of opposition to the deal among both May's own Conservative lawmakers and the Northern Irish Democratic Unionist Party (DUP), which props up her minority government. Supporters of a clean break with the EU say the backstop, intended to ensure no hard border between British-ruled Northern Ireland and the EU-member Irish Republic, could leave Britain forced to accept EU regulations indefinitely, or Northern Ireland treated differently from the rest of Britain. In legal advice the government was forced to publish on Wednesday, the government's top lawyer warned there was a risk Britain could get stuck in "protracted and repeating rounds of negotiations" to reach a deal to supersede the backstop. May's critics, including both supporters and opponents of Brexit, say that means Britain could be subject to EU laws long after it has given up any influence over determining them. May hinted she might give parliament a greater role in deciding whether to start the backstop or extend a transition period under which more EU membership terms would apply. "There are questions about how decisions are taken as to whether we go into the backstop, because that isn’t an automatic," May said. "The question is: do we go into the backstop? Do we extend ... the implementation period?" On Wednesday, May's top parliamentary enforcer, or chief whip, Julian Smith, spent an hour meeting with pro-Brexit Conservative and DUP lawmakers, listening to their concerns about the deal. But lawmakers who attended the meeting said he did not offer a solution to persuade them to back it. "This was not about doing deals, it was about listening," said one leading pro-Brexit lawmaker. Another said it was: "Too little, too late."